The long term success of any WebCenter implementation can only be achieved with widespread adoption and years of consistent and effective use by the target community. Our definition of a successful implementation is one in which our client’s achieve consistent value from their technology investment years after the initial project has been completed. With any technology solution, it is important to remain cognizant of the fact that the implementation and development phases are building blocks (albeit very important blocks) of a foundation for a successful project over time. It is the efficient and effective transition to the long-term management and maintenance of a technology investment that is often overlooked and is a critical aspect of any successful project. It is this understanding of success that drives our support service delivery model. We strive to ensure there is a smooth transition from project completion and implementation rollout, to the long-term management and maintenance of each solution. It is important to begin planning for post-implementation activities early on in the project and engage administrative and support resources in project activities, where appropriate. This involvement will ensure the resources focused on your long-term implementation plan have a clear understanding of solution direction, project challenges and key decisions regarding the architecture, configuration and enhancements to core functionality. These concepts are important to maintain as updates, upgrades and minor enhancements are considered throughout the lifecycle of a solution. Here is an example of TEAM’s customer-engaging, multi-phased implementation plan. The initial phase included the infrastructure implementation and Oracle WebCenter Content 10g application configuration, as well as a rollout to an initial target audience. The initial phase was followed closely by two additional phases to incorporate core WebCenter Content and web enhancements via Site Studio, as well as an expanded enterprise-wide solution release. During the validation portion of the initial phase, TEAM support services were engaged to assist with the QA process and rollout. A primary support Technical Account Manager (TAM) was assigned and involved in reviewing configuration information, as well as regression testing key features. This process enabled their TAM to gain a necessary level of expertise on their specific implementation, which facilitated a smooth transition to the post-rollout support activities. Throughout each phase of the project, their TAM maintained a focus on the stability and performance of the solution, while the consulting delivery team focused on the next phase of enhancements. Towards the end of each phase, the TAM was again engaged in validating and regression testing key features prior to any release. This engagement model resulted in a much for effective and efficient overall project process, ensuring general implementation issues or concerns did not impact or derail the delivery progress and related milestone timelines. 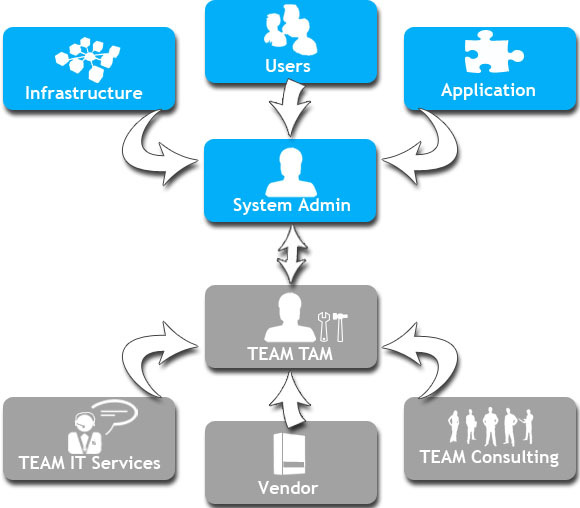 Now, as we enter new phases of enhancements and an upgrade to 11g technology, their TAM remains consistently involved in all activities and prepares new consulting delivery resources by reviewing their implementation, primary objectives and solution-specific caveats to be aware of during development and rollout activities. The engagement of their designated TAM has not only contributed to the success of each phase of the implementation, but also the consistent stability and performance of the complete solution over time. Developing an implementation plan that includes a long-term strategy for gaining value from your technology solution over time should be a key component of any project. Take into consideration your plans for responding to updates and required enhancements, as well as how you will maintain performance and ensure the stability of your complete solution. With a comprehensive plan that includes the management of your investment over time, you will be well on your way to achieving a successful implementation. This entry was posted on Wednesday, September 21st, 2011 at 10:47 am and is filed under Oracle, WebCenter Content. You can follow any responses to this entry through the RSS 2.0 feed. You can leave a response, or trackback from your own site.